The visually comfortable and appealing the giant print of the Modern English Version (MEV) Giant Print Bible allows you to further appreciate the clarity, accuracy, and reverence of the text. 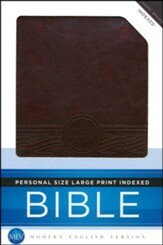 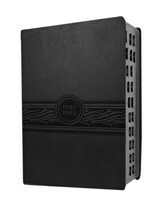 This beautiful leather-like Bible is ideal for personal study at home or at church. 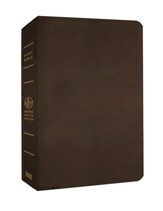 The MEV—"Today’s King James"—continues to garner wide acceptance among Bible users who respect the text of the King James Bible and desire a more modern rendering of the text. 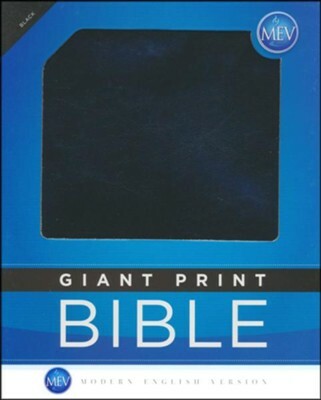 9.50" x 7.50" x 1.50"
The MEV/"Todays King James" continues to garner wide acceptance among Bible users, and each product extension is evidence of that. 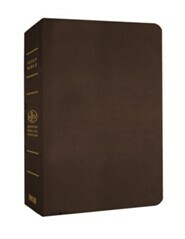 The most modern translation produced in the King James tradition within the last thirty years, this formal equivalence translation maintains the beauty of the past yet provides fresh clarity for a new generation of Bible readers. 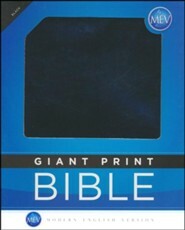 I'm the author/artist and I want to review MEV (Modern English Version) Bible Giant-Print, Imitation Leather, Black.